The 10 panel drug test checks the urine for 10 different types of drugs. This 10 panel urine drug test is often done for personal or compliance reasons. What drugs are tested in the 10 panel drug test? The 10 panel urine drug test checks the urine for amphetamines (e.g. Adderall, Methamphetamine, MDMA), barbituates, benzodiazepines (e.g. Valium, Xanax, Klonopin), cocaine metabolites, marijuana metabolites, methadone, methaqualone, opiates (e.g. Codeine, Morphine), phencyclidine & propoxyphene (e.g. Darvon). Why is the 10 panel drug test important? This 10 panel drug screen tests for drugs for pre-employment drug screening, school drug testing and personal reasons. This 10 Panel Drug Test is a urine test. The 10 panel drug test, also known as a ten panel urine drug screen, 10 panel drug screen, and a urine 10 panel test, checks the drug urine levels for ten different drugs. Frequently used as a screening tool prior to a new job or entrance in a new school, the ten panel urine drug test helps identify recent exposures to these drugs. This 10 panel drug screen checks for three additional drugs - methadone, phencyclidine or propoxyphene - when compared to the 7 panel drug test. Recent exposure increases the likelihood that someone will test positive on this 10 panel urine drug test. As such, most people who used a drug in this urine drug panel years ago will not test positive unless they were somehow exposed recently. This test does not run a confirmatory test if a specific drug comes back positive but it is highly accurate which, in most circumstances, makes that unnecessary. One common drug tested in this 10 panel drug test is amphetamines which forms the basis for Adderall. Adderall and its counterpart Myadis stimulate the nervous system and are used in treating ADHD, or attention deficit hyperactivity disorder. Adderall works by increasing the activity of specific neurotransmitters in the brain. Adderall also has been used recreationally to improve cognition, athletic performance and one's general sense of wellness. As can be noted from the description, this 10 panel drug test does not test for alcohol metabolites like the EtG test does. Additionally, it does not test for metabolites that might result from smoking tobacco as the cotinine test does. For people specifically looking for a more sensitive screen for the presence of marijuana, the marijuana metabolites test is a better choice. It is also helpful to know that this lab test is not considered a chain of custody test, during which specific drug testing protocols are utilized to reduce the likelihood that someone can cheat on the drug test. Chain of custody drug tests are used in specific settings like getting a special truck driver license to ensure that people meet compliance requirements. Our 10 panel drug test meets the needs of people or companies who need more general or routine screening for themselves or for new employees. If you represent a company or organization in need of 10 panel drug testing, you should consider setting up a drug testing account. We also offer special chain of custody testing through our corporate portal. To get a ten panel drug test near you, order online and get your urine test at the Quest Diagnostics lab that you selected. 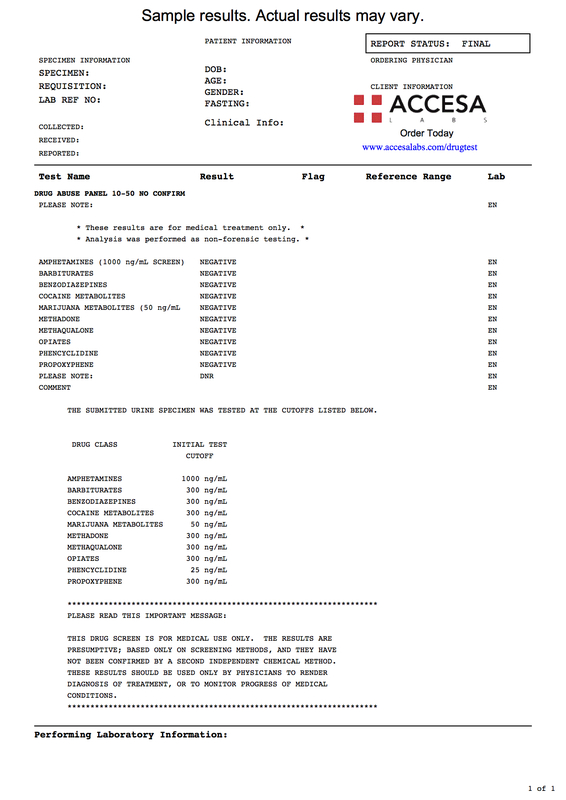 Once your ten drug screen lab results are ready, they will be available for download. As can be seen on the sample ten panel lab report above, the ten individual drug urine levels will be reported as negative if no drug is detected when compared against the cutoff levels provided by the lab. This 10 panel drug screen does not run a confirmation test if one of the components comes back positive. 10 Panel Drug Test at Guaranteed Prices.